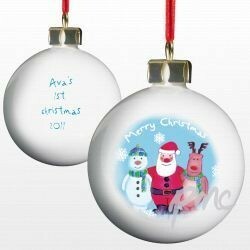 A fun christmas fine bone china bauble decorated with any message on reverse up to 50 characters including spaces over 4 lines. Please enter the personalisation exactly how you would like it to appear on the bauble. We will fit your message as the 50 characters allows over the 4 lines. A truly lovely keepsake for your special child's Christmas.